The battery life is a fantastic 11 hours, too. Lenovo’s Yoga 910 is the Yoga 900 convertible, upgraded—and the result is an incredibly well-rounded ultrabook that addresses all of our complaints from the previous version. That’s a rarity in the tech world. Not only is the new version more powerful than the previous model, it also now has a much longer-lasting battery, a faster SSD, and a gorgeous edge-to-edge display. It’s not perfect, of course, but it’s darn close. The already-capable Yoga 900 got a boost across the board to transform it into the Yoga 910. First and foremost, Lenovo has upgraded the CPU from sixth-generation Intel Skylake chips to the new and improved seventh-generation Kaby Lake platform, which offers a modest performance boost. The Yoga 910 has just one option for the CPU, the Intel Core i7-7500U, which is a dual-core part with hyper-threading, a base clock of 2.7GHz, and a boost clock of 3.5GHz. It’s paired with 8GB of DDR4/2133 memory, with the option of 16GB if you buy the most expensive model ($1,649). Yes, you read that right: DDR4 RAM in an ultra-thin laptop. Most Ultrabooks eschew the faster and denser DDR4 for power-sipping LPDDR3, but Lenovo decided to go for the memory-bandwidth brass ring instead. By the way, there doesn’t seem to be an easy way to access this laptop’s components, so forget about a DIY upgrade. The Yoga 900’s SATA SSD has been replaced with a much speedier PCIe NVMe drive, which addresses one of our gripes from before. In our tests, this Samsung PM951 M.2 drive delivered 1.2GBps sequential read speeds, with oddly low sequential read speeds in the neighborhood of 300MBps (the drive is rated at 560MBps). Still, it’s a huge upgrade from the SATA drive used previously. Both the base model we’re testing and the one above it sport the 256GB drive, while the top-end config features a 1TB SSD. This gorgeous display is glossy, however, so daytime reflections can be problematic. Its bottom bezel is absolutely massive, too: At over an inch thick, it looks out of place. Worse, because it’s the only open space on the display, Lenovo put the webcam there as well, making for awkward Skype sessions. (Yes, this is exactly the same design used by the Dell XPS and its Infinity Edge display.) I don’t use a webcam much, so I didn’t mind the trade-off, but heavy webcam users may find it a difficult design choice to live with. The last big change from the previous model is a bigger battery. Lenovo’s replaced the Yoga 900’s 66 watt-hour model with a 78WHr unit in the 910. The company says this upgrade increases the battery life during local video playback in the 910 by one hour—while the Yoga 900 claimed eight hours, the 910 claims nine. However, in our testing, we actually exceeded that figure (more on that below). Aside from small differences, the overall shape and design of the Yoga hasn’t changed. The revamped chassis is actually a tiny bit thinner, shrinking ever so slightly from 0.59 inches to 0.56 inches in the 910. Its depth saw a similar reduction, going down by an scant 0.02 inches. Yet strangely, the overall weight has increased, from 2.86 pounds for the Yoga 900 to 3.04 pounds for the Yoga 910. That’s still not terribly heavy for a convertible ultrabook, and it puts the Yoga 910 on equal footing with the updated and seemingly evenly matched HP Spectre x360. The Yoga’s trademark watchband hinge is still in place, looking as dazzling as ever. It allows for full rotation of the display, meaning you can use it as a traditional laptop or tablet, or just prop it up in a tent shape for screen-viewing. The keyboard is easy and comfortable to use, despite its shallow travel, and it has an excellent feel overall. It offers an adjustable backlight with two brightness settings. The trackpad is also perfectly accurate and is one of the best we’ve used on a laptop from any manufacturer. 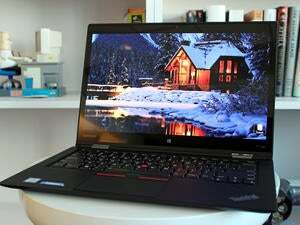 Port selection is quite limited due to the laptop’s thin design. On the right side, you get a headset jack and a lone USB 3.0 port that features always-on charging. There’s also a tiny button that allows you to enter the recovery environment or boot menu. The left side features a USB Type-C port that supports USB 3.0 and video out (DisplayPort natively or HDMI and VGA with a dongle). The power connector is actually a USB 2.0 port, but uses a USB-C connector—and strangely, it’s the only USB-C port you can use to charge the machine. Unfortunately, to create a more tapered chassis, Lenovo didn’t include an SD card reader. And despite its growing adoption, the company didn’t include support for Thunderbolt 3. Given the nature of convertible ultrabooks, there’s not much room to alter the notebook’s guts—nor the ability to go off in an unexpected direction with the internal design. So, much of the Yoga 910’s competition has extremely similar specs. 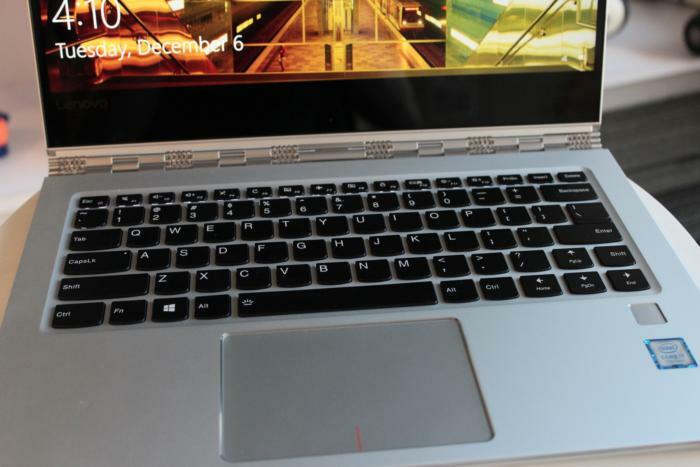 Its biggest rival, the HP Spectre x360, has an almost identical configuration. 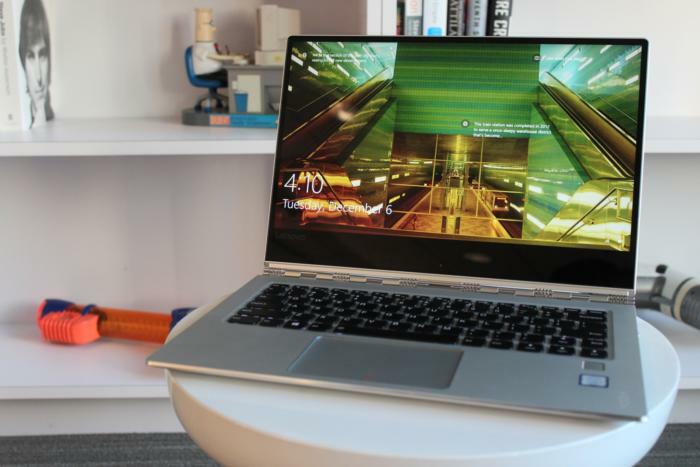 The Dell XPS 13 is similarly rigged-out, despite its traditional form factor. The Acer Swift 7 also shares many of the same specs, but uses a lower-end Kaby Lake processor. Asus’s Zenbook 3 uses the same Kaby Lake CPU as the Yoga 910. And then there’s the Surface Book i7. It’s a crowded field, so let’s see how the Yoga 910 fared. Given this notebook’s design and configuration, it’ll likely spend much of its life regurgitating spreadsheets and Word docs. We also envision a lot of PowerPoint in its future. 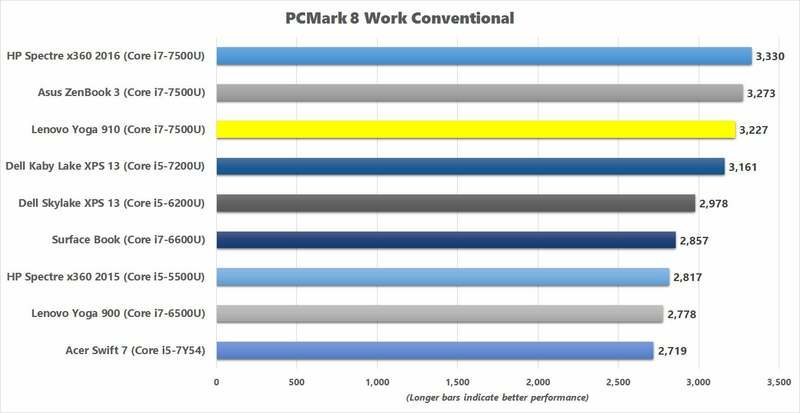 To test its chops in this buttoned-down environment, we ran PCMark 8’s Work Conventional test, which simulates a typical office workload: word processing, web browsing, video calling, and light spreadsheet editing. In no surprise, the Yoga 910’s score of 3,227 makes it well-equipped for office work. (For context, any machine scoring 2,000 or above will sail along smoothly during these low-intensity tasks.) Among its convertible ultrabook peers, the Yoga 910 finished near the top of the heap, no doubt thanks to its speedy Kaby Lake CPU. 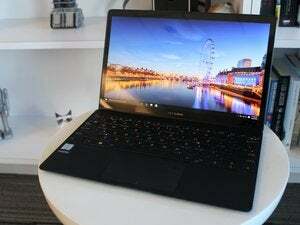 Its overall score was 12 percent faster than the Skylake-based Surface Book i7, and 8 percent faster than the Skylake XPS 13—the XPS 13’s stronger showing is likely due to the more powerful cooling in that laptop. Against the similarly equipped Zenbook 3, the Yoga 910 tied it exactly—their matching CPUs might have dictated the outcome. 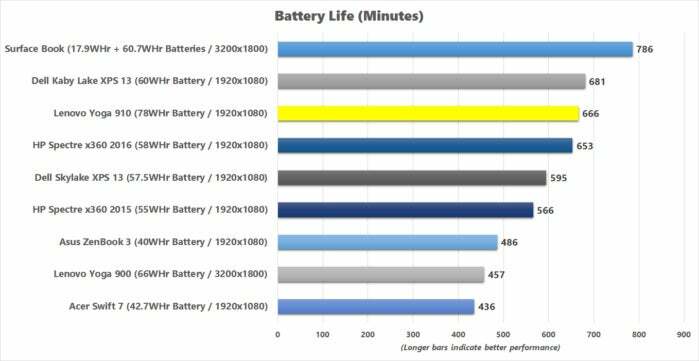 The HP Spectre x360 comes out on top, but its edge falls within the narrow margin of variance when running the benchmark. Overall, the Kaby Lake systems are about 10 percent faster than their Skylake counterparts, which is what Intel promised. Even if a Yoga 910 is business-minded, it may still have to grapple with the occasional brief CPU-heavy task. 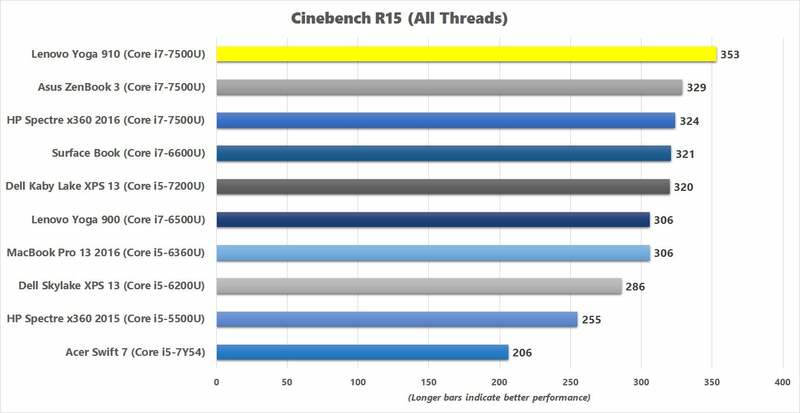 Accordingly, we fired up Cinebench R15, a 3D rendering benchmark that puts intense stress on the CPU for a few minutes. It’s a demanding test for any processor and scales well, too. Once again, the Kaby Lake U processors are an average of 9 percent faster than their Skylake predecessors. The Yoga 910 is the fastest ultrabook we’ve tested thus far. Its lead on the new MacBook Pro 13 and its Skylake CPU was even wider than the average of 10 percent—in this test, the super-slim Yoga 910 was 15 percent faster. Surprisingly, it was also nine percent faster than the HP Spectre x360, despite the fact that the HP has the same CPU as the Yoga. For ultrabooks, this CPU benchmark is more of a torture test than anything else: Using Handbrake to convert a 30GB MKV file into a smaller MP4 using the Android Tablet preset hammers hard on a processor. Handbrake will eat up as many CPU cores as it can while it encodes. You can’t get much more real-world than with this test. 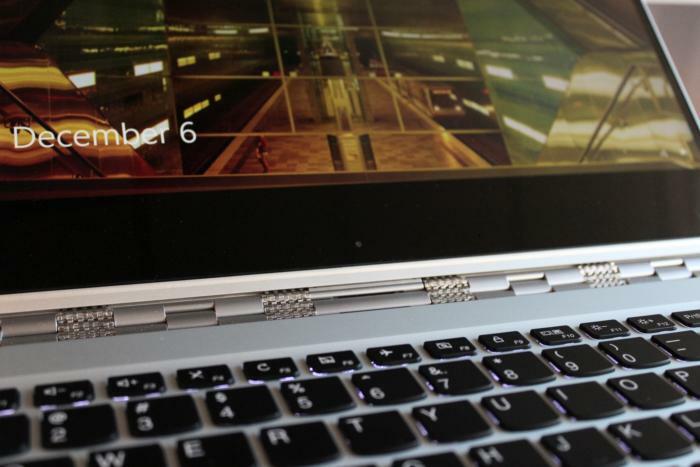 Impressively, Yoga 910 still streaks by most other ultrabooks. A few systems were faster, but by such small margins that it’s like a three-way tie. As expected, Skylake machines like the previous-generation Dell XPS 13 ran about nine percent slower than the Yoga 910. We know that an ultrabook's gaming chops are as thin as its chassis, but some people play very basic games on them anyway. Because the Yoga 910 is a Kaby Lake system, it rocks Intel’s new HD 620 graphics, which has the same specs as its predecessor, the Intel HD 520. However, given the overall improvements to the processor, it’s reasonable to assume the Yoga 910 will show a modest boost in gaming performance. 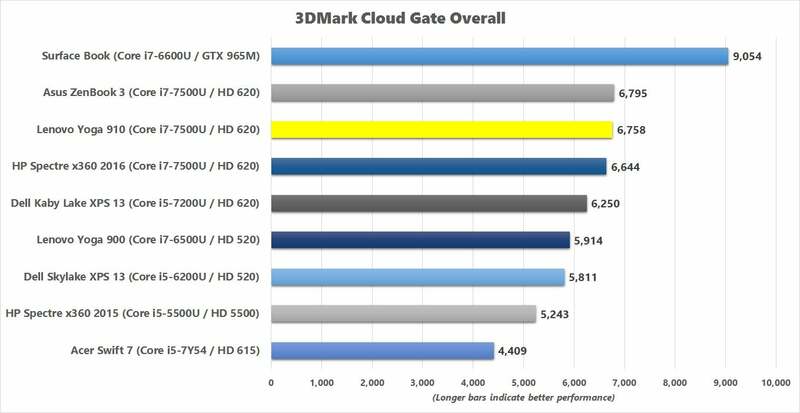 3DMark’s Cloud Gate benchmark i’s a lower-resolution test that runs at 720p and is designed for low-power notebooks. Compared to the 2016 Skylake Dell XPS 13, which runs Intel’s HD 520 graphics, the Yoga 910 was 16 percent faster overall. That’s about what we expected. 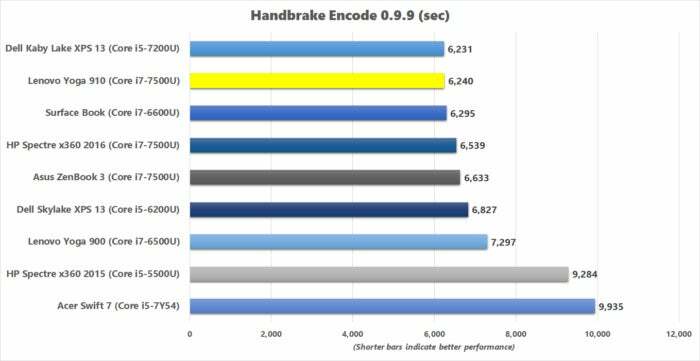 The Yoga 910 was also 28 percent faster than the Broadwell Spectre x360’s older HD 5500 chip. Of course, we’re examining this within a very narrow context—this doesn’t mean the Yoga 910 is a fast chip. It’s still integrated graphics running on a 15W CPU. 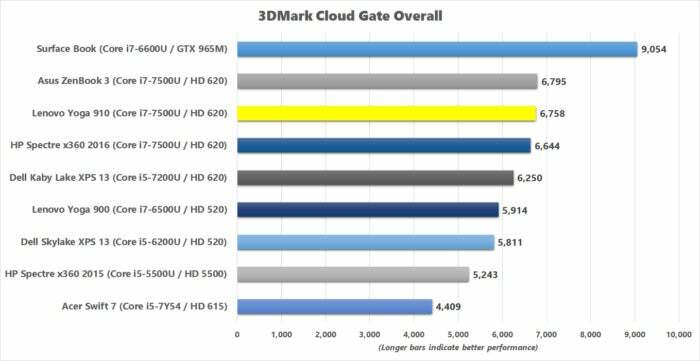 Still, it does appear to be moderately faster than the HD 520 in Skylake processors. Given the Yoga 910’s size, this ultrabook’s 78WHr battery is impressively large. More impressive is how it performed in our 4K video playback test, in which we run down a fully charged battery by playing a 4K UHD file on loop in Windows 10’s native Movies & TV app with sound on. Lenovo claims a battery life of nine hours for video playback, but that estimate is likely for the configuration sporting a 4K UHD (3840x2160) screen. On this 1920x1080 base model, we got a fantastic 11 hours and six minutes. The move to Kaby Lake certainly has boosted performance, but the Yoga 910 has a lot more going for it than just the latest CPU. Any company can shoehorn a new CPU into a chassis. The Yoga 910 is a seriously improved laptop over the 900 in all the ways that count—it’s easily one of the best convertible notebooks available. Even if you never bend it into other shapes, it’s still a fantastic ultraportable. It has class-leading battery life, a gorgeous display with a mostly razor-thin bezel, and excellent performance. And at $1,049, it’s also less expensive than its competition. Sure, the webcam’s placement isn’t ideal, and its slim stature means you're short on ports, but those are trade-offs we can live with, given the Yoga 910’s otherwise stellar attributes.